We build luxurious, high quality pools, in a timely fashion. 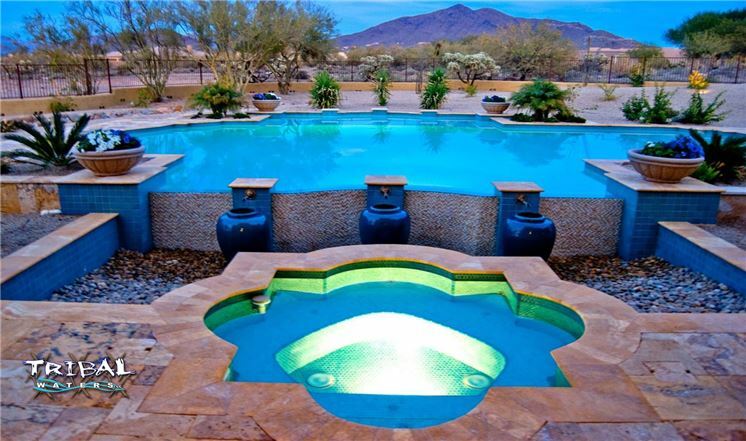 At Tribal Waters Custom Pools and Spas we are proud to deliver incredible, customized pools and spas to Phoenix and the surrounding areas. For more than 10 years, we’ve molded our passion for family fun and waterworks into a thriving pool, spa, and water landscaping business that transforms backyards into luxurious and beautiful spaces the whole family will love. 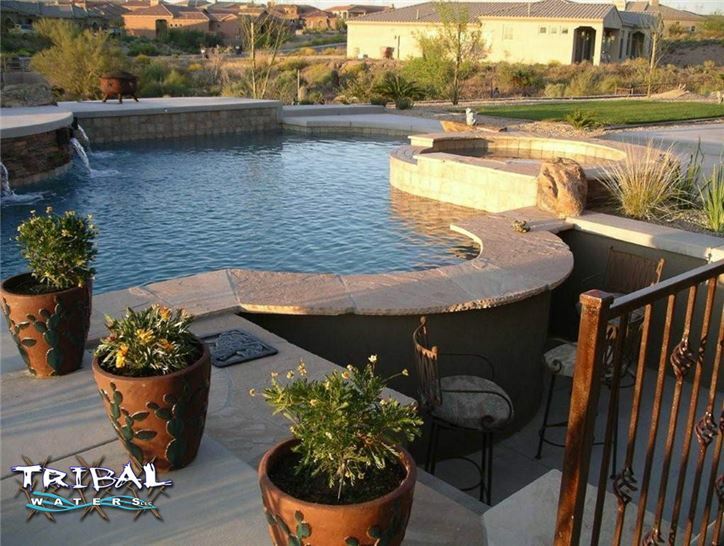 Our pool design and installation services are comprehensive and heavily involved, so when you choose us for your yard renovation, our experts will work closely with you to design the backyard of your dreams. We’ve chosen Arizona’s most experienced, knowledgeable, and talented design consultants to assist you in transforming your home into a work of art. We use state-of-the-art 3D software to illustrate every aspect of your project, offering unparalleled attention to detail and visualization options that will make sure your dream becomes a reality. No other pool company does it like we do. Looking for a fresh new design? 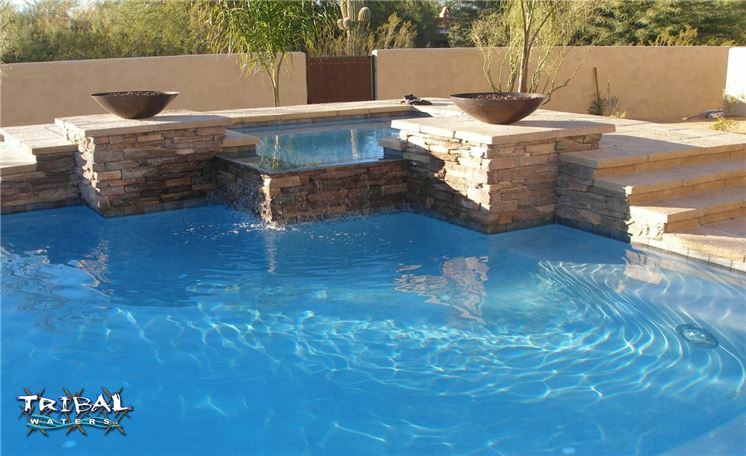 Interested in remodeling your current pool? Indoor and outdoor pool design and construction for your commercial property. 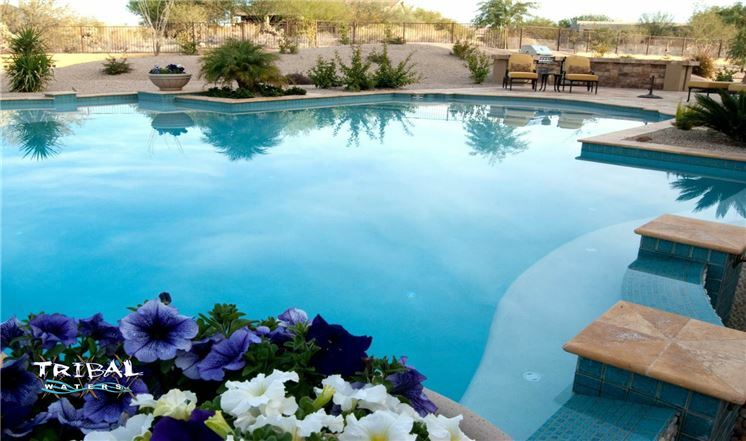 We take pride in making sure that every one of our customers is satisfied with their pool! 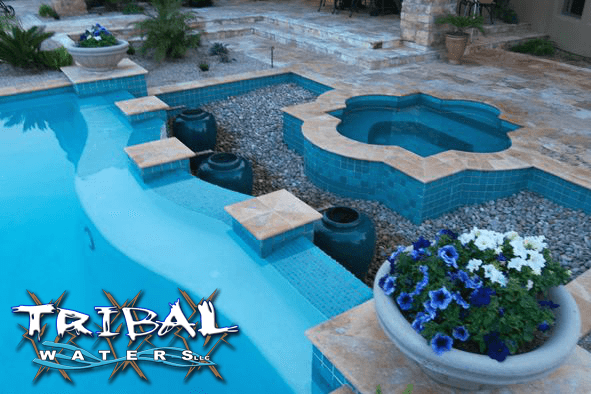 Tribal Waters offers an extensive variety of styles, options, and materials to choose from, ensuring your new pool, spa, or feature is exactly what you want it to be. We give you the power to make your project completely unique and special to you. Our state-of-the-art technology allows you to see it, change it, customize it, and perfect it before it’s installed. Since your full satisfaction is our goal, we always try our best to accommodate all of your needs and requests. You can trust our team to make your construction experience as stress-free and smooth as possible. 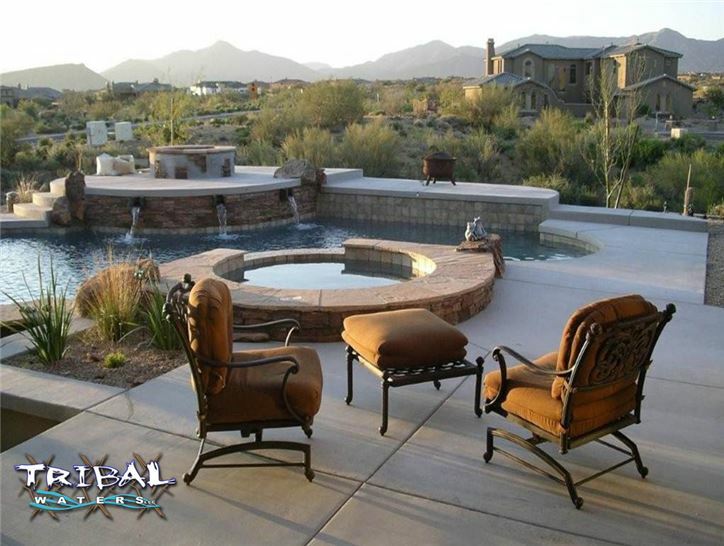 The products we offer go beyond customized pools and spas. 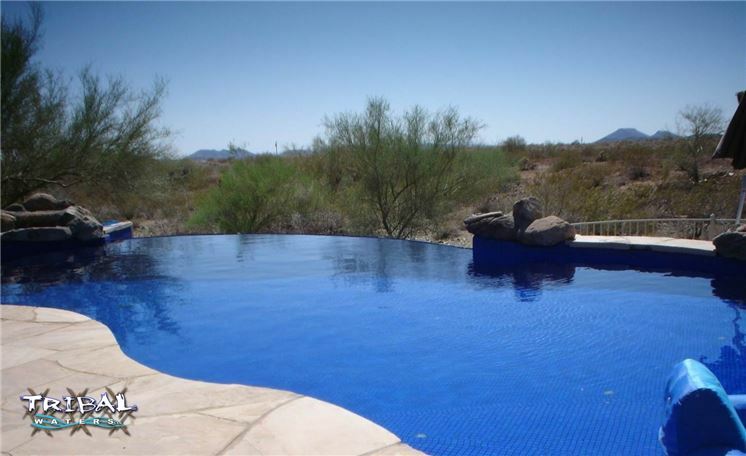 We offer pool remodeling, residential and commercial pool design and installation, spa and hot tub design and installation, pool decks, and hardscapes and water features. We can turn your yard into a gorgeous, luxurious attraction that everyone will love. Our reputation is built on our dedication to our customers, our high-quality craftsmanship, expert installations, and talented design team. We’ve never compromised quality or service on a job. Our dedicated management staff, highly skilled in-house construction crew, and extraordinary design team all work tirelessly to uphold our reputation as one of the industry’s leading pool and spa experts. With a combined experience totaling more than 100 years, you can be confident you’re hiring the best and getting the best when you choose us. All of our jobs deliver the highest quality of workmanship in the industry and we make sure we get the project completed on time. We also offer in-home estimates to give you reliable quotes and go over the options with you. If you’re tired of your backyard’s bland landscape, what are you waiting for? Call us today to get your in-home estimate. Here’s what some of our customers are saying about us and our work. My experience with Tribal Waters was awesome. My pool is beautiful and the construction quality from the stone waterfall to the cleaning system is the best. I get so many compliments on my pool! I am very happy and pleased and refer them all the time. Great company with really good people working there. I've seen many of their completed projects and have been impressed with the quality of work. Keep up the good work! Want to get started and learn what we can do for you? Let’s get connected. Call Us Today To Bring Your Yard To Life. (623) 587-8500.